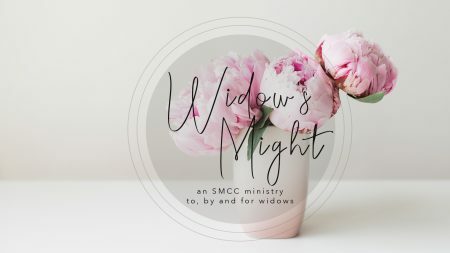 Widow’s Might is a ministry to, by, and for widows. This group welcomes widows from SMCC and the surrounding community to join their hearts and lives in support, encouragement and spiritual growth as they learn together how to grow spiritually by embracing God’s truth, love and strength for daily living. Widow’s Might meets the 1st Friday of each month in the Chapel, with fellowship and refreshments beginning at 9:30am; our next meeting will be Friday, May 3. During the meeting, the group shares prayer requests, prays together and engages in Bible study (usually a series on a biblical topic or from a particular Old or New Testament book; currently the group is studying the book of Daniel). Guests and new members are welcome. Sandwiches from a local restaurant are provided at a minimal cost. Coffee, tea and water are also available along with cookies and cake for dessert. Reservations are not required, just come! Day trips to nearby places of interest and to restaurants are planned for enjoyment, relaxation and fellowship, usually on the 3rd Thursday of the month. Guests and visitors are welcome. For more details about Widow’s Might, contact the church office at 978-6000.